This easy recipe for red wine short ribs is the perfect comfort food for a lazy fall weekend! Veggies and ribs cook long and low for an amazing flavor that will have them clamoring for seconds and thirds. Ah, these red wine short ribs! They are the perfect, hearty, easy way to welcome in fall. Because as much as I hate to say farewell to the basil and the local tomatoes and my flip-flops and sleeping with the window open, there’s something comforting about breaking out the cozy sweaters and the first fire in the fireplace of the season. And of a warm and wonderful supper bubbling busily on the stovetop on a gray Sunday afternoon. Ready to break in fall with me? Let’s make it!In addition to all the other wonderful things about this recipe, it also gives me a chance to use up those bottles of red wine that I seem to accumulate but that I can’t drink. And let me be perfectly clear, there are lots of bottles of red wine that I absolutely CAN drink…but I found out over the past year or so that they all have to say “pinot noir” or sometimes “merlot” on the label, or they give me a headaches. Tannins. Sigh. However! For some reason if I cook with those other varieties, they magically lose their headache producing powers – I’m guessing because the alcohol also dissipates as it cooks? One way or the other, this scrumptious supper gives me the chance to use all those Cabernets that I seem to always have around. While having a lovely Sunday afternoon glass of pinot noir while I cook. All of which reminds me of this. 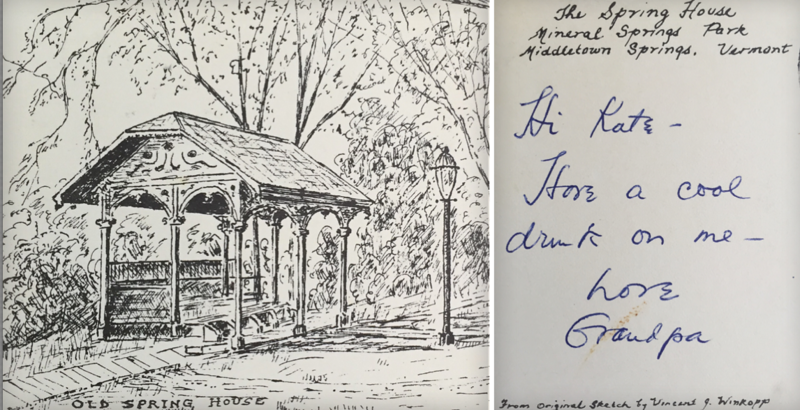 My grandfather was an amazing artist and an equally amazing jokester, and here he is demonstrating both, with his postcard sketch of the Spring House in our little Vermont village, and on the other side of the postcard his note to ten-year-old me. A cool drink on him. LOVE. Anyway, here’s how you toss together this lovely supper. First you need some short ribs, and if you have never tried making short ribs before this is the perfect way to start! You want the bone-in kind, and while you can use them as is, I like to ask my butcher to cut them in half so they are in nice manageable two inch pieces. Butchers are wonderful friendly people who are always so nice about doing things like cutting short ribs in half. You also want some onions and carrots and celery, and a whole head of garlic, and yes, a bottle of dry red wine. Cabernet is the best. 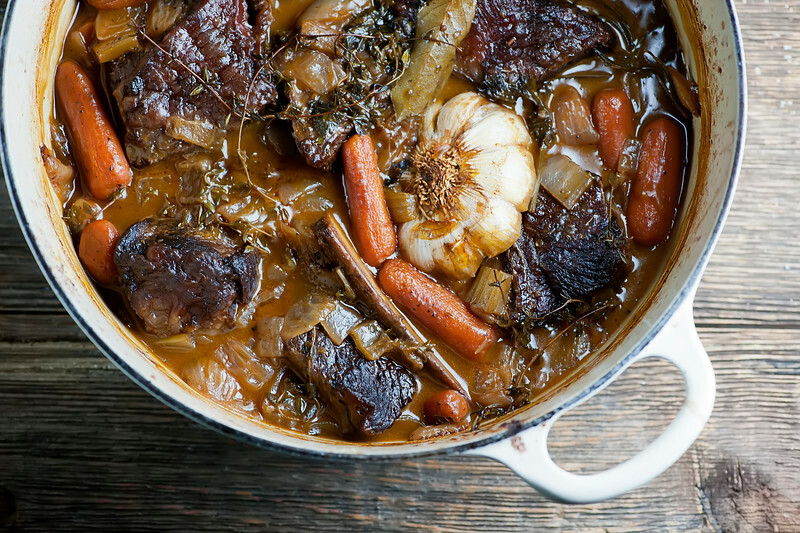 You are going to start by browning those short ribs in a large Dutch oven, and then cooking up the veggies for a few minutes in the beef drippings. That’s pretty much all the actual cooking you have to do because the rest of the recipe calls for simmer everything together in Cabernet and some chicken broth until everything is tender, first on the stovetop and then in the oven, which will give it a gorgeous, tender consistency. When it’s done, you can either serve it up as is, or if you want to die from short rib happiness, you can spoon it over brown butter mashed potatoes. So happy fall, and please have a cool drink on me with your red wine short ribs! Season ribs with salt and pepper. Heat oil in a large Dutch oven or other oven-proof pot over medium high and brown ribs on all sides. Remove from pot and set aside. Add onion, carrots and celery to pot and cook in drippings, stirring frequently, for 5 minutes. Add flour and tomato paste and stir for another minute. Pour in red wine and return ribs to pot. Bring to a simmer, turn heat to medium low and cook for 30 minutes. Preheat oven to 350. Add thyme and garlic and chicken broth to pot and bring to a simmer. Put the covered pot in the oven and cook for 2 1/2 hours until short ribs are tender. Season to taste with salt and pepper. If you are using the cream, stir it in now. Ladle ribs and veggies into warmed bowls and drizzle a generous amount of sauce over the top. This meal is wonderful served as is, but even more wonderful ladled over mashed potatoes or warm polenta or grits! I will, indeed, have a cool drink on you ;) I really don’t understand your concept of ‘wine left’, though, lol. Just kidding. Too bad that some of them give you a headache!! Good that you got to use them in this delicious recipe, though! High five for that! I love this type of food this time of year. It’s the absolute best, in my opinion. Your suggestion of serving with brown butter mashed potatoes sounds wonderful! Brown butter is completely awesome and that smell? Wish we could bottle that! Such a lovely recipe. Want to grab a fork and dig right in!! Wow, your grandfather was a very talented artist Kate. So sweet! These short ribs have my name and my husband’s all over it! It’s one of our favorite fall/winter meals. Can’t wait to try your version! Happy weekend! Oh my gosh, your grandfather was so funny!! I will too have a cool drink smiling! I love what you have done to these lovely ribs!! this is what comfort food is all about!! Pinned!!! He was! Thanks for the pin, Gaila! Kate, your recipes are the best! Not too complicated, no obscure ingredients, and they always turn out great. This looks absolutely brilliant, and I agree that I love red wine in cooking but I can sometimes also forget about a bottle of it that I’ve opened (I know some people would call me crazy for that). 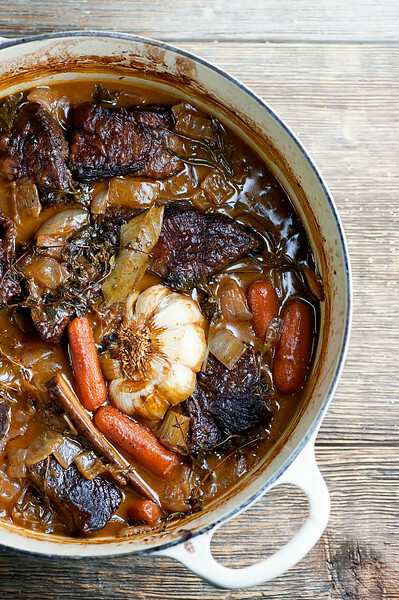 But this is the perfect way to use it up, a beautiful fall stew. Such a perfect dish for this weather, I love that glossiness. Great postcard too! i’m weird because i’d eat every single piece of meat-juice-infused vegetables, but i won’t eat that meat. i think the texture gets me, even though it’s so tender. whatever my hang-ups, this is definitely comfort food! Hi Kate – thanks so much for sharing! I made this tonight and the flavor was delicious! I’m curious if you use any special type of short rib? I’ve tried short ribs twice, and both times they were very fatty. I’m wondering if I’m buying the wrong kind of meat. Very good!! Made this tonight to welcome in fall &I this will become a fall regular at our home :) I rarely follow recipes exactly but I did this one & it was delicious. I’m so glad! It’s a fall regular in our house too – making it as soon as this heat wave leaves! This sounds so YUMMY, cannot wait to try! Question though, instead of placing in oven for 2 1/2 hours, what about using a crock pot for this portion of the recipe??? I don’t see why not! I think on low for about 8 hours would work just fine – if you try it that way, come back and tell us how it came out! Absolutely delicious and a hit at girls night! Made this tonight for dinner. I had to wing it with the measurements because I only had less than 2lbs of short ribs but it turned out fantastic! I can’t wait to make it again using the amounts called for in the recipe! Stays on my dinner list! This recipe is so good. My family and I really enjoyed it. I made sure I had the right amount of everything. Thanks for sharing. Your recipe calls for chicken stock but the instructions say chicken broth … which is it or does it matter? Thank you, planning to make this tonight! Oh my goodness, thanks for catching that! Either one will work fine, but for consistency’s sake I’m going to adjust the recipe to say chicken broth. Thanks for letting me know and hope you love it!! Hi! What size (quarts) would you recommend for a Dutch oven for this recipe? Hi Hayley! I make this recipe in a 5.5 quart Dutch oven – here’s the exact one I have: https://amzn.to/2D5APba – hope this helps! I have made this before and Hubs and I love it! My question is would it change the cooking time if I added chopped up potatoes? Have you ever added potatoes to this recipe?